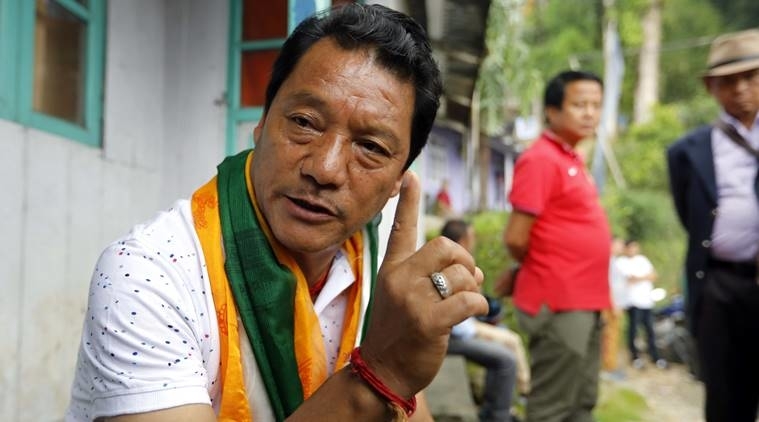 After a spell of silence, Darjeeling once again witnessed a war of words exchanged between Bimal Gurung and Binay Tamang, the two factional heads of the Gorkha Janmukti Morcha (GJM) when they sparred over the National Register of Citizens (NRC) issue. Assam has a significant population of Nepali speakers who are mostly concentrated in the Sonitpur district of the state. Many Gorkha names were among the 40 lakh names left out of the final draft of the NRC. This revelation had prompted Binay Tamang to make statements assuring the Gorkha people that he would ensure that their status as citizens would not be affected. The recent spat began on August 4, when the still in hiding Gurung issued a statement from an undisclosed location. He expressed his support to the Gorkha people of Assam and appealed to the Union Government to handle their cases with the utmost sensitivity. However, he also alleged that the government of West Bengal was planning on settling 'Bangladeshis' left out of the final NRC in the hills. He based his allegations on another allegation that the government of West Bengal was 'secretly' measuring land in the hills to settle the people there. Gurung then made a vague statement that the Gorkha, Mech and Koch Rajbongshi people would resist any such plans. Anit Thapa of the Binay Tamang faction hit back the next day challenging Gurung to prove his claims. He then alleged that the Bharatiya Janata Party (BJP) was planning to implement an NRC in West Bengal to chase away the Gorkha people. This prompted Prakash Gurung of the Bimal faction, to then challenge the Tamang faction to identify the 'Bangladeshis' living in North Bengal. The Tamang faction, for the time being, had the last word on Tuesday, when Alok Kanta Mani Thulung mocked Bimal Gurung by telling him to ask Rajnath Singh about Gorkhaland since everyone was still waiting for that meeting. This was a reference to the 105 day shutdown last year when such a meeting was promised. What makes the current spat interesting is that the Gurung faction has shown a shift in the dominant thinking on Gorkhaland and north Bengal as a whole. Rather than only talking of the Nepali speaking population of the region, they also spoke about the Mech and Koch Rajbongshi people. This new shift is significant because north Bengal is not affected by the Gorkhaland demand alone, but the Kamatapur movement also exists around the same region. The Kamatapur movement for statehood is led predominantly by the Koch Rajbongshi people. Kamatapur was the name of a medieval kingdom that rose in the area of the erstwhile Pala kingdom. The kingdom stretched included regions of modern day north Bengal, Nepal and a few districts in western Assam upto the Cachar hills region . This also coincides with the geographic spread of the Mech and Koch Rajbongshi people. The modern Kamatapur statehood demand is actually a reference to the geographical extent of this medieval Koch kingdom. The Kamatapur movement has its roots in North Bengal as the Koch Rajbongshi people residing in the western part of Assam had been successfully assimilated into the larger Assamese population. However, the people who lived in West Bengal obviously had grievances. One factor for their grievances could have been that the community was included as a Scheduled Caste (SC), whereas they wanted to be considered as a Scheduled Tribe (ST) community. In Assam, the community has been agitating for ST status and is one of the six communities being considered for receiving it. The problem of caste did not arise until the time when the region became a part of British Bengal. Unwilling to be termed as 'mlechhas' by the Bengali caste hierarchy, some members adopted the surname Rajbongshi meaning the king's caste, as part of their aspirations for upward caste mobilization. However, post independence, the community realised that the policies of the government could uplift the community only if they qualified. This was when some began adopting the surname Koch. On a side note, these political developments can cause many Koch Rajbongshi people to be left out of the NRC if it is implemented in West Bengal. The Kamatapuri language has enough similarities with both Bengali and Assamese, and is often termed as a dialect in both states respectively. This further compounds the problem faced by the community as the linguistic basis for state formation can be denied. The Kamatapur movement has on several occasions blocked the railways and highway to signal their demand. On July 20, the All Koch Rajbongshi Students’ Union (AKRSU), the All Assam Koch Rajbongshi Mahila Sanmilani (AKRMS) and the Chilarai Sena launched a 24 hour shutdown in western Assam. Their demand was for ST status and a Kamatapur state. However, despite such tactics, the demand seems to be heading where the other demands of Gorkhaland, Bodoland and Twipraland among others have reached, i.e. a stalemate. In the long history of the Kamatapur movement, the more hard line elements in the movement had created the Kamatapur Liberation Organisation (KLO) out of the All Kamatapur Students’ Union (AKSU) in 1995. The KLO was formed with the blessings of the United Liberation Front of Assam (ULFA). At present, they are a part of the United National Liberation Front of Western Southeast Asia (UNLFW). However, it is unclear whether the organisations demanding statehood at present have links with the KLO. Perhaps the only parallel to the Kamatapur statehood demand is that of Nagalim since it consists of areas that form a part of other states. However, unlike Nagalim, the Kamatapur movement is not based on a single ethnic identity, but that of a forgotten kingdom. Thus, when the Bimal Gurung faction speaks of rallying the Mech and Koch Rajbongshi people alongside the Gorkhas, they show that they have a better understanding of this complex region which perhaps is a precursor to the complexities encountered as one travels further east.